When I was writing the review for Dovetail Games Euro Fishing I managed to catch a few Boss fish. This one was a particular beauty. 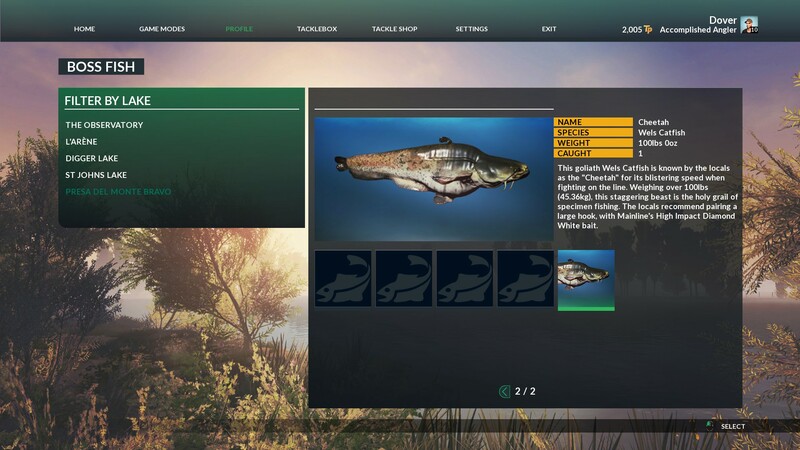 The Cheetah is a 100lb Catfish that resides in Presa del Monte Bravo and is the largest Boss fish in the Euro Fishing. At the time I was playing in a Total Weight tournament, and this catch was in the final moments to lift me up a good few rankings. Patience was the key factor. I had no right to make this catch. The line I was using only had a breaking weight of 35lb (in the video I just cast my 45lb line before the other line starts beeping), so there was a LOT of reel work involved. As for the bait and hook involved? I’m afraid at this point I can’t remember the exact combination, though it was likely to be the Korda KD Rig 4 with either the Korda Dumbell 18mm or the Activ-8 Pop Up 15mm.